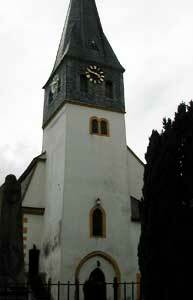 Evangelical Kirche in Schweiger, district of Heilbronn, Baden-Wuertemberg called the Boger Church. The town church consecrated to John the Baptist goes back to a building of the 13th century and was enlarged by Bernhard Sporer in the early 16th century. This is the ancestral church of the Barringer Family. This is the home church of Rudicilli/Rudisill family who came to Pennsylvania and North Carolina. The church was built in 1767. 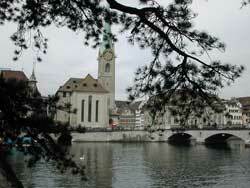 The building is a protected monument in the center of the town.. It is the oldest building of the town. In part, this is an excerpt from the article Protestant Chuch (Michel field) of the free encyclopedia Wikipedia. Surnames on a 1949-1945 Soldiers’ Memorial at this church include Weigel, Mueller, Wolfherd, Keilor, Sebruger, Bender, Linse, Spies, Rembert, Beck among numerous others. Ancestral church of the Rudicil family. It was in existence for 250 years in 1985. Frauenkirche located in Zurich, Switzerland is a 9th century church. The tower dates from 1732 and the stained glass from the 20th century by Marc Chagall. Ancestral church of the Bollingers. There are Bollingers in Catawba County area and one or more led wagon trains to Missouri in the 1800’s. Heinrich Bullinger (18 Jul 1504-17 Sep 1575) was a Swiss reformer, the successor of Huldrych Zwingli as the head of the Zurich church and pastor at Grossmuenster. 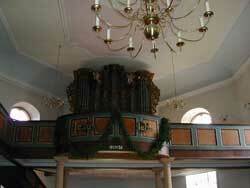 Evangelische Kirche der Pfalz, Hassloch, Bad Durkehim, Rhineland-Pfalz, Germany. 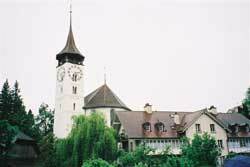 Hassloch is a charming little town with one of the most interesting museums re Betty Griffin. Hassloch, because it was ruled by the Counts of Leiningen, is a protestant community, evidenced in the oldest church buildings: Christuskirche (Christ Church or Church of Christ). The Steffisburg Church in Steffisburg, Bern, Switzerland was Catholic at one time but became protestant during the reformation. The nearest modern equivalent would be Church of Christ. 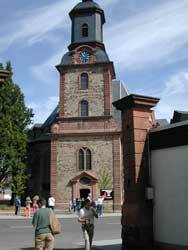 The Steffisburg Church was completely restored between 1980-1983. Extensive archaeological remarkably detailed history of the church has been constructed. 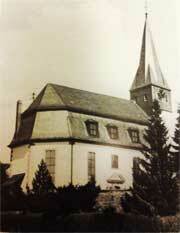 The first church was erected in the early Middle Ages, estimated to be 700. Second church built on the same site; estimated about 1000. One wall survives as the present south wass of the Steffisburg church. 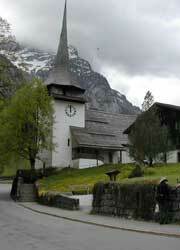 About 1320 a clock tower was added; about 1491 a chapel was built. About 1681 the Romanesque basilica was torn down and a new church was build on the same site. The church standing today is more than 300 years old. Gsteig St. Joder/Yoder Chapel,Gsteig bei Gstaad, Obersimmental-Saanen administrative district in the canton of Bern in Switzerland. It is the ancestral church for the Yoders in Pennsylvania and North Carolina. There are also Koli/Coleys and Linebergers that went there. Hueffenhardt Church, Baroque Protestant Church located in Hüffenhardt within Karlsruhe, Neckar-Odenwald-Kreis, Baden-Wuertemberg : The Baroque Protest church dates in its present form from 1738, at that time the nave was rebuilt. Inside of a historic barrel vault that spanned the church is located on a two-story wooden loft a historical Overmann organ. The balustrade of the gallery is decorated in the first Empor Tight lap-round with painted in oil Bible scenes. The altar is made of wood with veneer and inlay work, which is in the Kraichgau and Small Odenwald rather rare. Behind the altar is a baroque decorated historic pulpit. The baptismal font was donated in the late 18th century. 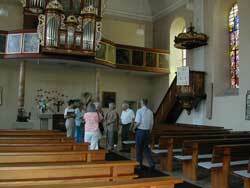 In the church there is also a historical Helmstatt epitaph with nearly life-sized sandstone sculpture. In 1496 the area was under the Synod of Wormser. According to Dr. Don Yoder the Sigman/Sigmann/Sigmon, Haas and Eckert/Ekerd families came from Hueffenhardt, Germany to PA and NC. In 1780 Joh. Sigmann gifted the church with an alter he crafted. 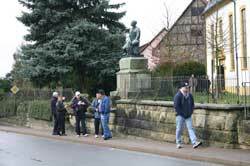 In front of the Protestant church there is a memorial to the veterans 1870/71 and a war memorial to the fallen from 1927 in 1914-18 (after the war expanded to include the names of the dead 1939-45). The historic Protestant parish office and a modern fountain complete the ensemble to the Protestant church.